Cape Town – Disney's live-action remake of the 1941 animated classic, Dumbo takes flight in cinemas this Friday. Ahead of the film’s release here are some interesting facts that will enchant you. The basic story of Dumbo dates back to 1939 as a planned novelty item called a Roll-A-Book - a box with little knobs that readers turned to read the story through a window. Authors Helen Aberson and Harold Pearl wrote the story Dumbo the Flying Elephant. Whether the Roll-A-Book was ever produced is a mystery - none have been located - but when Walt Disney purchased the rights to the story, he published about 1 430 copies of a regular book-version of the story. Dumbo was originally slated as a 30-minute short film. It ultimately expanded to just under 64 minutes (Disney’s second shortest animated feature film behind 1942’s Saludos Amigos, which was just 42 minutes). 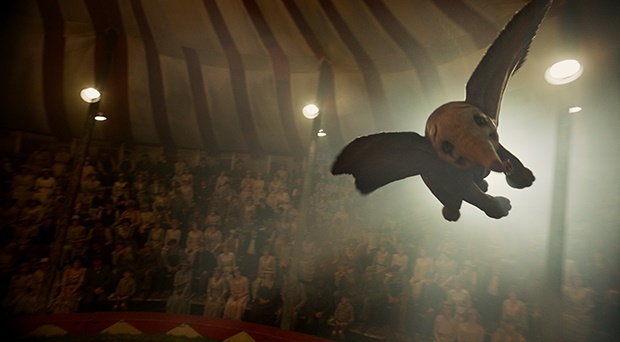 The live-action reimagining of Dumbo utilises state-of-the-art visual effects to portray Dumbo and many of his four-legged counterparts. Director Tim Burton and his production team wanted to honour the minimal and expressionistic look of the original animated film. To bring the look into the live-action realm, they studied film noir to develop stripped-down environments and lighting strategies - ultimately striking a balance between reality and expressionism. 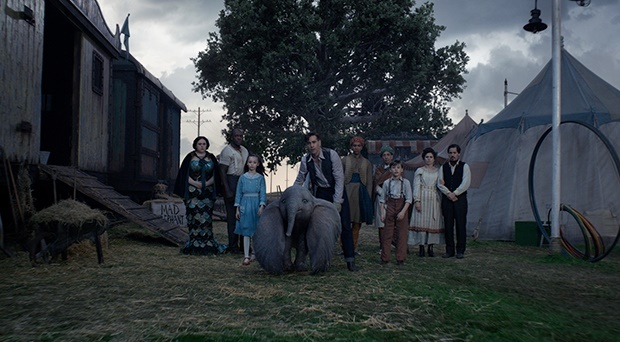 Dumbo was shot just outside London on soundstages at Pinewood Studios East - becoming the second film to shoot in the new section of the famous film lot. Colin Farrell is no stranger to horses, having appeared in several films that required extensive horse riding (Alexander and Winter’s Tale among others). But when the Dumbo script described his character as a former circus star with a popular equestrian act, Farrell trained with a lasso and horse-riding instructor. The props department armed Milly with books by physicist Marie Curie to showcase the character’s passion for science. Nico Parker, who portrays Milly, spent some time studying the books to better understand her character - but says she doesn’t share Milly’s scientific leanings. Actor Roshan Seth, who portrays snake charmer Premesh Singh, comfortably carried a live python around his neck in most scenes that featured him. In the film, Ivan the Wonderful and Catherine the Greater are a husband-and-wife team of illusionists who care for Milly and Joe after their mother passes and before their father returns from war. Real-life couple Miguel Munoz and Zenaida Alcalde portray the duo. The Spanish performers specialise in physical theatre, trapeze and magic. Filmmakers felt strongly about featuring real circus performers to infuse a sense of authenticity to their circus. Fourth-generation circus performer Kristian Kristof from Hungary was hired to share not only his extensive knowledge of the circus, but his international circus connections. The result was a multicultural array of performers, including jugglers, clowns, knife throwers, contortionists, a dog trainer and more. Eva Green portrays aerialist Colette Marchant - but the actress joined the production with a serious fear of heights. A professional aerialist was hired to double for Green as needed, and worked with the actress to build her confidence in the air. In the end, Green conquered much of her fear and was able to perform a lot of the choreography. 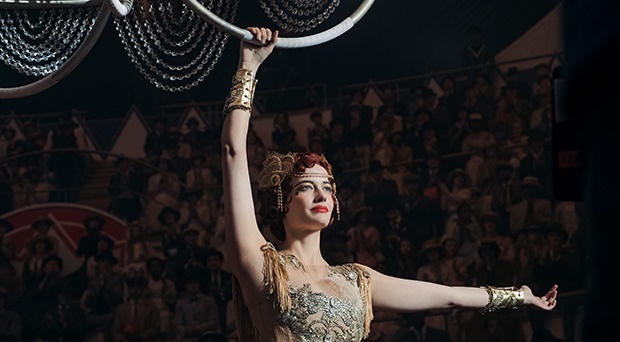 To play the role of aerialist Colette Marchant, Eva Green had to exude not only the physique, but the fluidity such a performer would embody. Personal trainer and aerialist Francesca Jaynes was tapped to work with Green. One of the strategies employed to build strength and elegance was ballet. Sharon Rooney, who plays Miss Atlantis, was tapped to sing the iconic song Baby Mine in the film. The song holds a special place in Rooney’s heart - her grandmother used to sing it to her when she was a child. Rooney also had to play the ukulele for the scene - she’d never picked up the instrument before. It took her just a week to learn to play the song.